Holiday shopping requires stamina. It’s hot, you’re moving quickly, looking for sales and bargains. You need patience and a calm and cool demeanor. You can be out and about for four hours straight, which some people run a full marathon in. I know that your body can absorb up to 200 calories an hour so it’s important to do your shopping and holiday errands fully fueled and hydrated. How do you do that? Eat first: a balance of protein and carbs. I look for equal amounts favoring protein, if any imbalance at all. 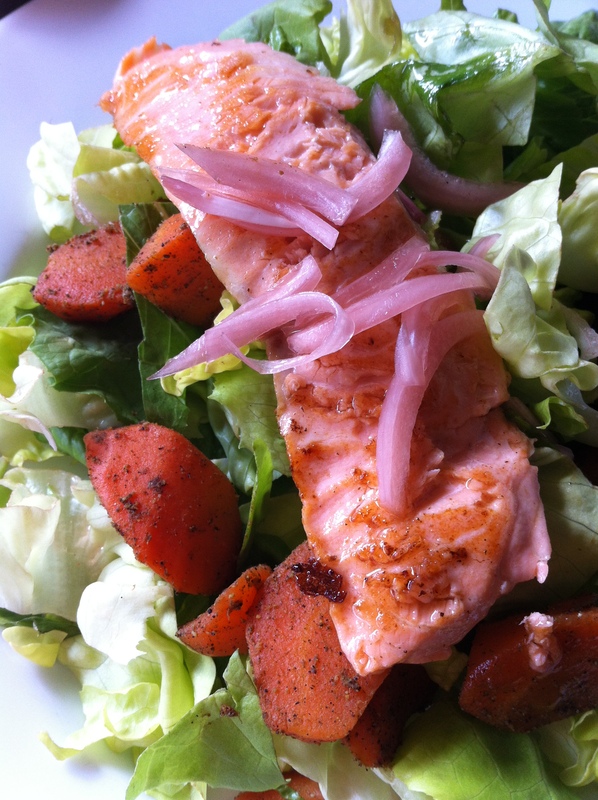 Today, cumin roasted carrots and grilled salmon on a bed of butter lettuce, oh and some pickled red onion for a perfect bite. « Just Ask. Restaurants Want to Please.